Jon Nettlesbey & Terry Coffey | Writing "Always Coca-Cola"
Terry Coffey (left) and Jon Nettlesbey in the studio. 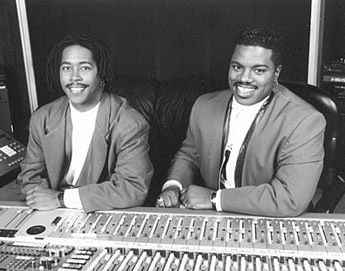 Terry Coffey & Jon Nettlesbey are probably best known in the music industry for writing and producing many R&B/Pop hits in the ’90s for such artists as Keith Washington, Howard Hewett, Miki Howard, Alexander O’Neal and Aaron Hall. They wrote or produced three #1 R&B hits, along with several other Top 10 R&B hits. Within a two-week period, the Coca-Cola executives made their decision, selecting Coffey & Nettlesbey’s jingle for their massive, new advertising campaign. The jingle was initially projected to be used for just a year or two, but because it was so successful, it became Coca-Cola’s theme song for the next six years. The jingle first came out in January 1993, and received heavy play during the Super Bowl and other key broadcasts. Coffey & Nettlesbey went on to produce numerous, different versions of the jingle, for both radio and TV. This included producing jingles in every conceivable music style, such as country (they worked with Randy Travis), rock, salsa, jazz (working with Take 6) and symphonic. In addition, the jingle was recorded in 170 different languages for Coke’s worldwide ad campaign. Many of the foreign versions featured dubbed vocals over Coffey & Nettlesbey’s track. Finally, in 1999, Coca-Cola decided to create a new campaign, utilizing the theme, “Enjoy.” Once again, Coffey & Nettlesbey had to compete with many other writers for this new jingle gig, but they prevailed. Their new jingle, “Coca-Cola Enjoy,” was selected to lead the next Coke campaign. “Coca-Cola Enjoy” debuted in spots at the beginning of 2000. The duo recorded about 50 new spots during the year. Coffey & Nettlebey remain grateful for their enduring success in the jingle world. They realize that they were in the right place at the right time, coming up with the “Always” jingle exactly when CAA was trying to launch a great new campaign for Coca-Cola.